Hopefully you added Chris Paddack and Pete Alonso, our top adds for last week. Both players are owned in pretty much all competitive leagues by now. All ownership percentages listed are for ESPN leagues as of Sunday. Jason Heyward (52.6%)- Chicago fans are holding their collective breaths that finally, FINALLY, Jason Heyward might be hitting the way they imagined he would. The power is there (four home runs), the base stealing is there (three steals), and the glove has always been there, which should enable him to be in the lineup every night. 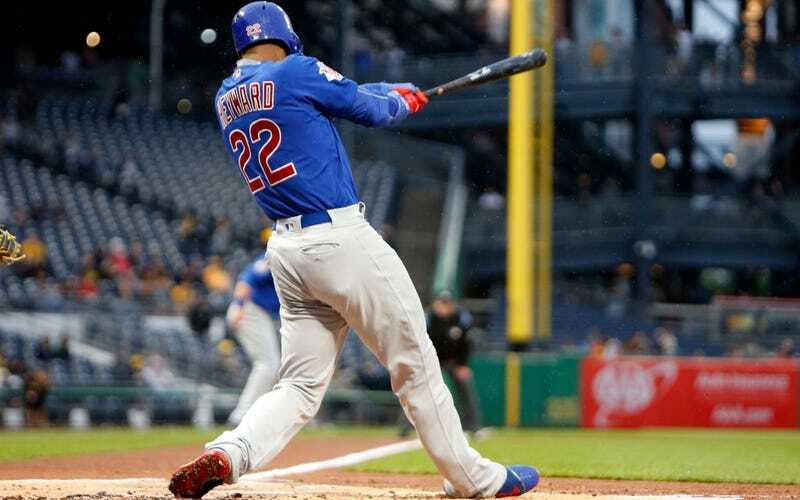 If his bat can find the middle ground of Heyward-to-start-2019 and Heyward-of-last-year, he will do just fine on fantasy teams with the star-studded hitters in the Cubs’ lineup. Domingo German (34.4%) – One of the few bright spots for the Yankees injury ravaged roster to start the season, German has displayed an early ability to limit baserunners and pump up owner’s strikeout numbers. Last year’s high ERA should be taken with a grain of salt, as his FIP indicated that he was a much better pitcher than his stats indicated. German should be added if there is a need; he will certainly help you in K’s and wins. Daniel Vogelbach (44.4%) – Massive Power. That’s pretty much all you need to know with Vogelbach. He has the frame and swing to be an elite slugger, and is now being given the every day chance in Seattle, regardless of the injury status of Jay Bruce. Vogelbach’s ownership is going to be skyrocketing within the week, so add him now. Plus, how would you NOT want to be rooting for this guy on your team. Other names to consider adding: Clint Frazier, Omar Narvaez, Mitch Moreland. Yu Darvish (76.4%) – We touched on Darvish last week, but our sentiment has only grown stronger. Darvish probably has a little too much value to be dropped outright, but if you can trade him for a roster-worthy player, it should be considered. His most recent start saw him not allow a walk, but he gave up two long balls with the wind blowing in from center at 20 mph, not a great sign. His other starts this season he’s had extreme issues with control, and as always with Darvish, the injury risk is prevalent. Rick Porcello (75.6%)- Similar to Darvish, Porcello might have some value left among league mates, so try to trade him off first if you can, but if you can’t, and someone better is on the waiver wire, consider making the drop. Porcello has never been a dominant strikeout pitcher, so he has never been able to help you there, but this season he’s giving up hits at an extremely high rate (22 hits in 11.1 innings). It’s gotten so bad to start the year that even Chris Davis is getting hits of Porcello. Never a good sign. Evan Longoria (32.2%) – If his name wasn’t Evan Longoria his ownership would probably be in the single digits. Don’t expect Longoria’s slugging ability to come back in his age 33 season, especially in pitcher friendly AT&T Park. He’s gotten off to a slow start to the season, and in a lineup devoid of above-average hitters, don’t expect the run producing situations to increase. If you’re still hanging on to his name recognition, it’s time to rethink and drop him for the best available. Other names to consider dropping: Marwin Gonzalez, Ian Desmond, Nathan Eovaldi.